MagniLink Mira are video magnifiers that offers all necessary low vision functions in an affordable package. They have been ergonomically designed to maximize the ease of use, and are modern and flexible video magnifiers, ideal for use at home. 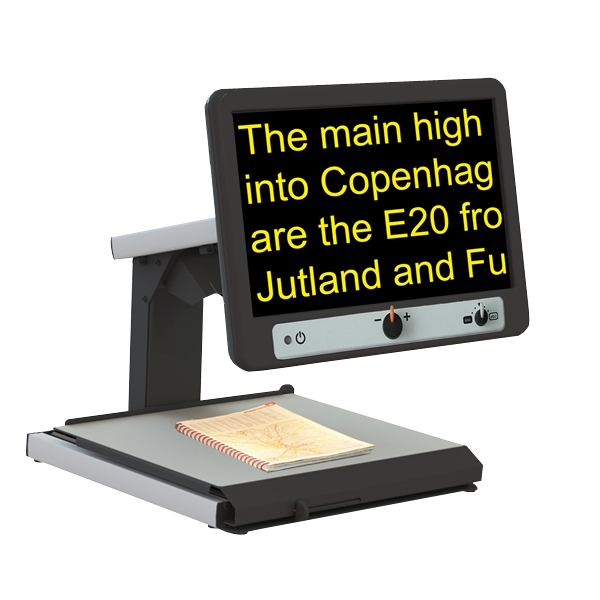 The video magnifier MagniLink Mira is plug & play. Just grab the unit from the box, connect one cord to the wall socket and push the start button. MagniLink Mira is very easy to use, which makes is popular for the elderly. All control buttons are designed in different shapes and are placed directly on the integrated high quality monitor (18,5” or 23”). Simply place your book on the reading table, set the magnification level, choose your desired colour mode and you are ready to go. MagniLink MiraLite can also be delivered with a High Definition camera which is ideal for users who need a crystal clear picture from a lower magnification. The initial magnification starts at 2.0 which provides a great overview.